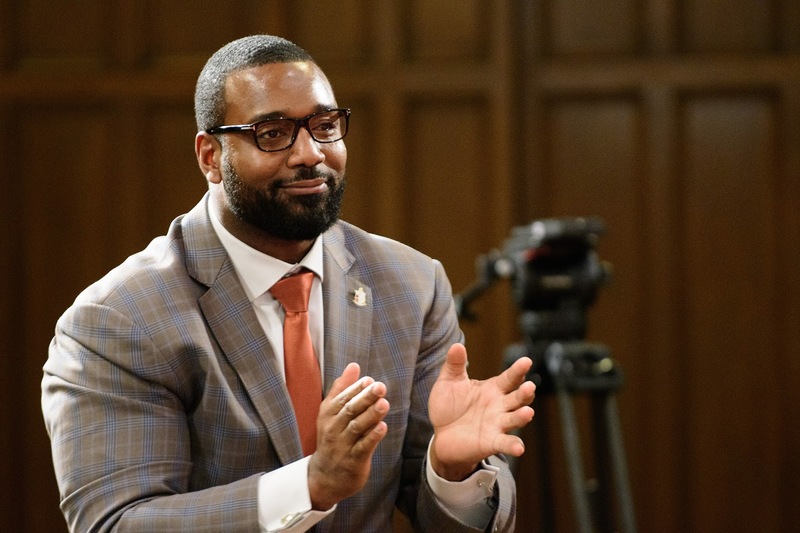 When one hears the name Chris Canty, he or she might think of the 11-year NFL veteran, the Super Bowl champion, the former Cowboy, Giant, and Raven, the $42 million man when he signed a six-year deal with New York. Well, the two are now one in the same, as Canty has made the transition from successful football star to successful on-air talent. Two years after playing in his most recent NFL game, his deep voice can now be heard throughout the airwaves every weekday from 10 a.m. to 1 p.m., alongside Alan Hahn’s and the No. 1 pick of the 1999 NHL Draft, Rick DiPietro’s, where he has been a member of the show since November of last year. The show is shown live-to-tape on the MSG Network later on in the evenings. While he is technically listed as a free agent, he seems very content with the new, less physically demanding, but, in his own words, more critically challenging, lifestyle. Canty made a name for himself on the football field, while also earning a nice paycheck and a Super Bowl ring in the process, but his career path and aspirations have since changed over the last couple of years – one thing that hasn’t, however, is his size – he is still a very large human being – probably the largest member of the media anyone might ever see. Q: Is there much of a difference between preparing for a football game and a radio show? A: It’s interesting, because it’s not only how much you know in terms of be able to go on air, but it’s about delivering the information and entertaining, because it’s all personality driven, where as in the NFL, it’s different. My job is to do homework, but ultimately our homework is just to put me in a position where I can make the play without doing too much thinking. I would say there’s probably a little more critical thinking with being an on-air talent versus being a football player. I don’t want to feed into the stereotypes that playing football is mindless, because it’s not. There’s always a game within the game, but I would definitely say that being an on-air talent, delivering the same information, driving different storylines, it’s probably a little more difficult being entertaining and doing that than it is stepping in between the white lines and playing football. I guess it comes more naturally for me to be able to play football than it is to be able to talk about sports. Q: What have been some of the harder parts for you about the transition? How difficult is it to stay on top of all of the information coming with, now that you have to follow every sport? A: Well, it’s not difficult to stay on top of, because I love watching sports – again, it all comes down to the delivery of it. There’s that on a microlevel in terms of how I sound personally, but also how the show sounds. They’re not necessarily the same thing. You gotta remember that there are two other people in the room, and it has to be a conversation that’s entertaining, not just one individual being entertaining. So always being aware of your teammates and what they’re doing, and being able to sense the conversation in a way that’s entertaining where people can follow it. And so, that’s the challenge each and every day, and it’s something that I look forward to. It’s a challenge to go out there on game days and play in front of the fans; it’s also a challenge to be able to deliver good content in an entertaining fashion. Again, they’re different, but the fact that it is a challenge is what’s exciting about it. Q: What’s it like to work with Alan and Rick every day? A: It’s fun. Those guys know sports. They have their own thing going, and they were gracious enough to allow me the opportunity to come in and join them. Even when I was playing for the Baltimore Ravens, I would come into the studio during the offseason and spend some time with those guys and have the opportunity to join the show, which has – it’s been awesome. I’m thankful for them for the opportunity to be able to do it. They make it really easy, because they know sports – they follow sports. They’re passionate about it, and that comes across in their delivery and their takes for all of New York sports. Q: Who is the better athlete, you or Rick? A: I don’t know if either one of us are much of athletes. I’ll tell you what – we both keep in pretty good shape, I’ll say that about both of us. Q: I’m hearing Rick is being dubbed the best-looking guy in the studio right now – is that true? A: I’m not gonna judge the beauty contest of the “Hahn, Humpty, & Canty” show. I’ll just say I feel good about the way I look. Q: Going back to the transition, you go from dealing with the media after every game, every practice – was the transition tough, to go from someone who has to deal with the media to the literal, complete opposite. Q: I feel like it’s easier for you to talk to athletes, because you know what they want to be asked, right? A: Yes and no. I try to provide them a platform to be able to share whatever insight that they would like to. I’ll frame a question in such a way that guides the conversation, but I don’t want to answer the question for them, if that makes sense. Q: Do you also feel that because you are a former athlete, do athletes feel a little bit easier, knowing that you’re there, and they can open up a little more, because you have their back in that situation? A: Yes and no. Sometimes, that can work against you. In terms of guys thinking that you’re potentially trying to set them up or trying to make them give an answer that they might not necessarily want to give, because again, I do have the insight of being a professional athlete. I do know when somebody is giving you the standard company answer or company line, and I feel like I have a responsibility to our linters and our viewerships to get real takes, to get more insight from that player, so it can kind of go both ways, if that makes sense. Q: Let’s go back to your early playing days – you were supposed to be a first-round pick, but injuries dropped you to the last pick of the fourth round. How much did you want to prove everyone wrong, and how much did your draft stock falling hurt? A: It was a humbling experience. I can remember being in that situation – I was just praying to God that I had an opportunity, and I was fortunate enough to be drafted. To be honest, it was nothing short of a miracle, because the injury I had, the dislocated knee which tore three ligaments…to the detached retina that I had during the offseason while I was training for the Draft, being a mid-round draft pick was still pretty good considering all of the medical red flags. I was just thankful that I had the opportunity, and I wanted to make the most of the opportunity. I understood that there were a lot of odds stacked against me, but I wanted to do everything and capitalize on the opportunity. I think I squeezed as much paste out of the toothpaste as I could. Q: How in the world do you go from Dallas to New York? A: Easy – 42 million dollars. Q: That is the best answer I’ve ever gotten. A: Not complicated at all. I wanted to go to a team that was going to give me financial security and make a commitment that was going to secure my future. But I also wanted an opportunity to win, because I understood what that did for my legacy as a player, and then opportunities post-playing career. The Giants won the Super Bowl in 2007, and I felt like it was a team that had a quarterback that could already win a Super Bowl, that had a formula, a couple of tweaks here and there, add a couple of pieces here and there to rebuild the roster, and it was a chance that the Giants could be right back in this thing, and I was fortunate enough to be able to get the financial security and to be able to win a championship ring in my hometown. A lot of different things made sense. The New York Giants wasn’t the best financial offer I had during the free agency period, but it was the one that made sense. Q: How much of that rivalry is more fan-generated, or is it really a locker room rivalry as well? A: A lot of it is fan-generated, but I will say this: the teams in the division, you don’t really like, because you play them two times a year. There aren’t really a whole lot of secrets. There’s always gonna be that bad blood between those respective NFC East teams, and the Giants and the Cowboys are no different. It seems like the Giants always have the Cowboys’ number, the Cowboys always have the Eagles’ number, and everybody beats the Redskins. Q: Was there a difference in culture as far as the infrastructures of the teams compared to one another? A: To be honest with you, the organizations are more similar than they are different. I think that the Cowboys are a little more freer, because Jerry Jones has a little bit more of a personality than I would say John Mara does, but I think the organizations are very similar. Everybody understands their responsibility. Everybody does their job. Everybody is accountable. They were more similar than they were different to be honest with you. Q: Describe the Super Bowl XLVI team. A: That’s probably as close-knit of a team that I’ve ever been a part of. Each and every guy cared about one another, and it goes well beyond football. Everybody on that rosyter believes in something bigger than themselves. And I think that’s a key factor when we talk about any championship team, because of the level of commitment that it requires in order to achieve that level of success. If it’s just about you, I don’t know if you can be as motivated. When it’s about something bigger than you, then that brings a certain level of consistency with your approach, because you don’t want to let down your teammates. I think it’s an important thing to care about your teammates, when you start talking about teams that win championships. It seems simple, but it’s really hard to create that. It really is. Q: You had a career high in sacks and tackles that year. How did it feel to have arguably your best season in which you accomplished the team goal. A: It feels good, because you feel like you contributed to your team’s success at the highest level. But again, that team was not about individual stats. It was about being our best when our best was required. And if you recall in 2011 season, we started out hot that year, and then we did a month of losing. We lost four straight games. But it was the fact that guys were willing to stick together, guys were in it together, we were consistent in our approach, and ultimately, things clicked at the right time. Q: How is it to see how close-knit you were now, and what advice have you given the younger players? A: The way that we interact with each other speaks volumes. You see 30, 40 guys from those championship teams coming together, having a good time and not missing a beat even though we haven’t seen each other in years, I mean, that speaks volumes. That’s the thing, that you have an opportunity to create. Because I’m looking at this current Giants team, this is a team that can contend for a championship for the next couple of seasons – that’s what you need; that’s almost like the missing ingredient. That’s the lightning in the bottle that everyone talks about with championship teams – it’s about caring about one another. It’s about loving your teammates. You might not like everybody that’s on the roster, you might not like each and every guy. And it’s not required that you like them, but you gotta love them, because ultimately, you can’t let that guy down. And that love that you have for your teammates is what’s gonna keep you from letting them down in that critical moment that you have to go against human nature in order to make the play. That’s the difference, and the margin of error is so small when you talk about teams that contend for championships. A: It’d be hard to argue against that Jets game. We were 7-7, and we had to win the next two in order to make it to the playoffs. But I think that game up in New England during the regular season made us realize we can beat anybody when we play at our best. That game the 2007 Giants had against the Patriots at the old Meadowlands stadium when the Patriots were undefeated. The Giants lost by three points, 38-35, but they knew that they can compete with an undefeated team. And when they saw them again in the Super Bowl, they had the confidence to be able to perform and be able to win that game. Q: What’s your goal with your foundation (The Chris Canty Foundation)? A: The goal is, basically, to allow kids to raise grades and realize their full potential. That’s ultimately what we’re after. It’s about academic enrichment, being able to provide the resources and supplemental materials for teachers and staff at our partners’ schools. So things that supplement the common curriculum of those respective schools. It’s also about be able to emphasize the importance of physical fitness through the camps that we set up for kids throughout the school year, and particularly in the offseason. As soon is school is over, we have the Camp of Champions, which is a camp I’ve been hosting over the past decade. The thing I’m most proud of with my foundation is that the kids involved in our programs are required to give back, so we organize community service projects, an initiative that requires the kids to give something back to their respective communities, be able to establish positive relationships with their communities so the communities understand…they get a chance to know the kids that are there. So I think that’s important to be able to establish that positive relationship, and being able to emphasize the importance of kids giving back at an early age. That’s how I learned to give back, as my parents required us to give back when we were kids, and that’s something I’ve done throughout the course of my entire life. So we’re just trying to pay forward the opportunities that I’ve had in the next generations of kids and hopefully being able to teach them the importance of being able to do the same. Q: How important is it for you now, going from a football player to a broadcaster, to get the support from your former teammates and ESPN Radio? A: It’s important. It’s always helpful when your boss allows you the opportunity to be passionate about the things you care about. I host the golf tournament every year, the third Monday of May at Alpine Country Club, and the purpose of it is to be able to fundraise, to be able to support all of the programs that we have for our kids in the tristate area. So to be able to do the “Hahn, Humpty, & Canty” show from Alpine Country Club the day of the golf tournament was a tremendous blessing – I was thankful to my boss Tim McCarthy and Ryan Hurley for providing the opportunity to be able to do it. We had a great time, and we were able to fundraise, and the proceeds from the golf outing that we had the last couple of years was gonna go toward a project that we have at P.S. 43 in the Mott Haven section of the south Bronx where we’re actually building a playground for the school, so we’re excited about it, the school is excited about it, the students are excited about it, and so being afforded the opportunity, to be able to do my job and have the platform and be able to continue to affect positive change in kids’ lives, it’s awesome. It really is. Q: How important is it for you to pass the message along to younger players about being involved in the community? A: It’s important, because ultimately, we’re in a rare position – to be able to have the platform of being in the National Football League, so many people look at us, and I understand it also gives players a voice to be able to do some really good things – I encourage guys to take advantage of that opportunity, because everybody doesn’t have it. Being a voice to the voiceless, being somebody that can stay in the gap for communities, individuals in need, it’s something that shouldn’t be taken lightly. I think it’s all a part of our social responsibility, because we have the opportunity to be a part of the National Football League, and again being a part of the National Football League to prove that it’s not a right. So I think this goes along with having the privilege of being in the NFL. Q: Where do you see yourself three-to-five years from now? Broadcasting? Coaching? Or are you just enjoying the ride and seeing wherever the road takes you. A: Wherever the road takes me. Right now, doing what I’m doing, I enjoy it. It’s a good quality of life for me. Being able to be around sports, but being able to also have some free time to do some things, continuing to work with my foundation, have more time to play golf, even though I’m not that good, it’s pretty cool. I see myself in this role for the foreseeable future.